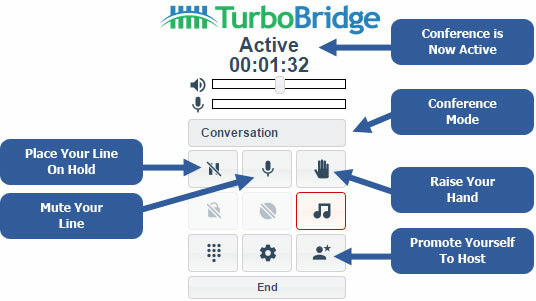 TurboBridge WebCall is a web-based utility which allows anyone to participate in a TurboBridge conference call by simply using a Chrome or Firefox browser with a computer headset. There's no separate software program to download or install, and no registration required. WebCall uses an emerging technology called WebRTC that enables real-time communications over the Internet. WebRTC is enabled in the current versions of Chrome, Firefox, Opera and Chrome on Android. 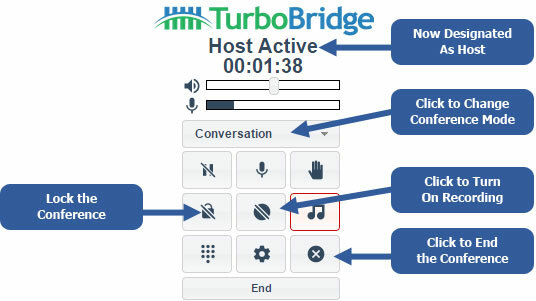 Conference participants can access WebCall at https://www.turbobridge.com/webcall/, or by clicking on the Login link at the top of the TurboBridge website, then selecting TurboBridge WebCall, which connects them to the WebCall login page. Pricing. There is no charge to the conference participant to use WebCall. There is also no charge to your TurboBridge account if you are enrolled in a Flat Rate billing plan that includes unlimited Toll Access. 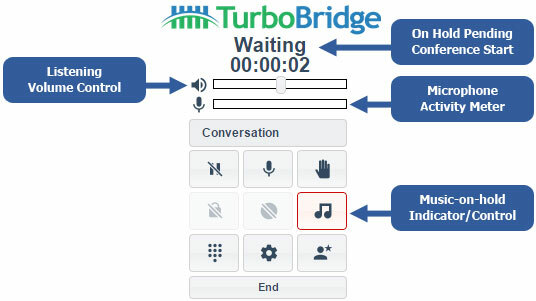 If you are enrolled in a pay-per-minute plan, your TurboBridge account will be charged 1¢ per minute (per caller) for WebCall usage. Login into WebCall. 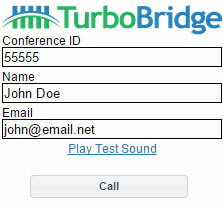 Go to https://www.turbobridge.com/webcall/ and login with the Conference ID for the conference call, plus your name and email address. The name you enter will be displayed on the Host Control Panel and listed in the conference email report. 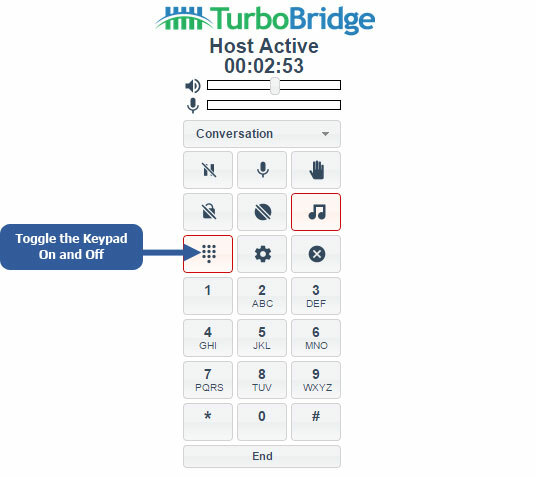 (While TurboBridge does not verify a caller's identity, the IP Address is logged in our system, and the Caller ID field will display the IP Address if no email address is provided.) Click on the Call button to join the conference. Allow WebCall to Access Your Microphone. 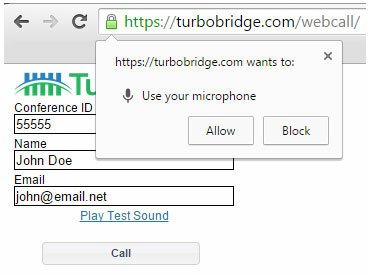 The first time you access WebCall, your browser may ask you for permission to allow WebCall to access your computer microphone. Click on the Allow. Conference Pending View. If you are the first participant in the conference, or if the conference is pending the arrival of the Host, you will hear hold music (if enabled on the conference bridge) and “Waiting” will be displayed at the top. You can click on the musical note icon to turn off the hold music. Active Non-Host View. Once the conference call begins, the status at the top will change to “Active”. The top row of icon buttons allow you to toggle settings. If you wish to make yourself a Host for this conference, press the icon button near the lower right corner. You will then be prompted to enter the Host PIN. Entering Keypad Commands. WebCall does not provide control buttons for the full set of available Keypad Commands, but you can enter these commands via the WebCall keypad panel. To activate the keypad, click on the icon button near the lower left corner. End Your WebCall Session. Click on the End button at the bottom of the dashboard to remove yourself from the conference call and end your WebCall session. This does not affect other participants in the conference. Some mobile data connections may not deliver acceptable audio performance.